Janet Cardiff’s incredible sound installation at the MOMA’s PS1 in Queens. Go now – it’s here through January 9, 2012. You have to feed and move your body to be healthy – we know this – but to feel truly alive you have to feed your soul, too. Today’s post may seem like is a bit of a departure for Tuck Takes Off, but stick with me. Yesterday was Yom Kippur, the holiest day of the year for Jewish people. Instead of going to temple, I opted to visit a museum to experience a specific work of art, “Forty Part Montet” by Janet Cardiff. I knew this piece – I had seen it in 2005 and it really got to me. In fact, it took me somewhere, somewhere spiritual. When I read in the New Yorker that it was back in town, I knew I had to go, and it was a lucky coincidence for me that the dates lined up with this auspicious holiday. And so yesterday morning I hopped on the subway to PS1 in Queens. And true to form, the art did not disappoint. Cardiff is a spatial/acoustic artist and she creates pictures and spaces with sounds. For this piece, her sounds are of 40 human voices singing a close harmony, Renaissance-era sacred a capella choral work , Spem in Alium, by the composer Tomas Tallis. Tallis’ work is a masterpiece. He wrote it in 1573 (scholars think it was for Queen Elizabeth’s birthday) and it was to be sung by 40 singers divided into 5 groups of 8 people. The pods of singers were then arranged in a horseshoe shape across the floor and balconies of a huge English cathedral, so the sounds would bounce off the walls and windows of the stone space and reflect and resonate and undulate around and among the worshipers below. The idea was revolutionary: listeners could not distinguish a single voice or note progression – there’s no singing along here as brains and ears can’t wrestle with this much information – so they had to surrender to the wall of sound and simply let it take them over and guide them to what must have felt like an unearthly higher plane. Put that in your pipe, 1573. – subscribers, click on this link. Cardiff takes this idea and modernizes it. 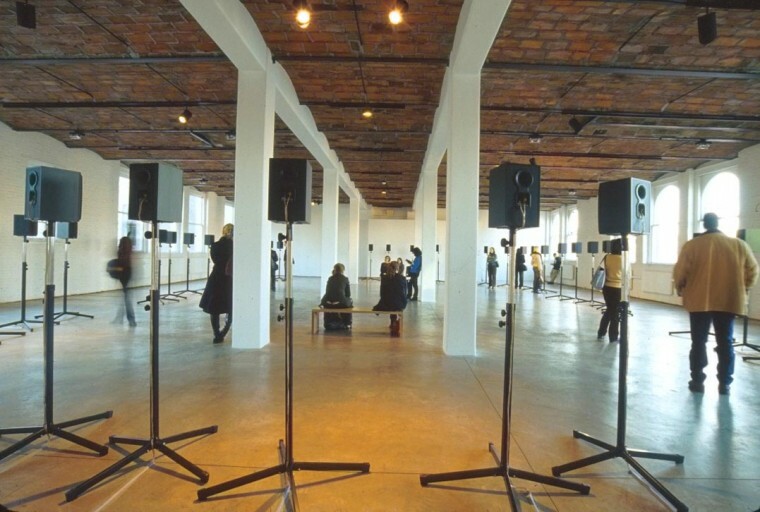 Each voice is recorded separately and piped through a unique free- standing speaker and the speakers are arranged in a large oval in a bare room. You, the viewer/listener, walk around the room and with each step the experience changes: stand close to one speaker and you will hear a distinct and expressive human voice, you’ll perceive one person’s path within the music. With so many harmonies every single singer seems to add to the edges of the sound – there is no central, core melody. Move towards the center of the room and it’s the blend, the collective, you feel and hear. The music takes a more concrete shape. With so many harmonies, the music swirls and circles you, and that is part of the heavenly magic of the piece: like molecules of water coming together to form a wave, it washes over you. Pods of singers start and stop as the piece progresses and I found myself hungrily chasing the sound, moving from speaker to speaker to get my fix, feeling the music resonate in my chest cavity as if I were singing myself, feeling the tingle as the fine hair on my arms stood up as perfect chords sparked lingering harmonic echoes. And just like when I experienced this piece in 2005, I was walloped by powerful emotions. Both then and now, upon walking into the room I immediately had tears streaming down my face. I wasn’t sad; I wasn’t even consciously thinking. My response was visceral. I suppose, if can put words to it, I was touched by the beauty people create together. By the life in each voice. And the joy I heard in them and the joy I felt. Angels. We can be angels. I have heard the mermaids singing/each to each…and they are we. I circled round and round the room, alone, so happily, cheeks wet and drippy, and when the music stopped 14 minutes later, I heard someone exhale and sigh. It was the security guard. She was crying, too. No lie.